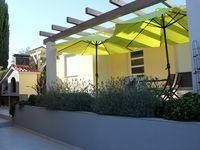 Property 11: Seaside house for 4-5 persons with private jetty 35 minutes from Split Airport. Best ever VRBO stay in a beautiful location! 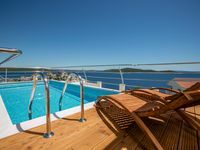 As an active VRBO user, we experienced our best overall experience at Ivan&rsquo;s beautiful 2 bedroom home by the sea in quiet Brodarica. Ivan greeted us personally, walked through the house, chatted about the surrounding area&rsquo;s highlights and left us with a nice welcome package including home-grown grapes. Clearly a caring host, extremely personable, excellent communicator and takes pride in his home and neighbourhood. The 2 bedroom detached house was in a very quiet community and a 30 second walk to the sea (on the other side of the street) with nice swimming (pebble beach and concrete) area, suitable for kids. It resides in a family orientated neighbourhood with rows of detached homes, many having their shoreline dock and swimming area. There also a number of restaurants to choose from within walking distance. The house is extremely well appointed with brand new furniture and appliances throughout. This home is the best equipped stay we have experienced. Beds were very comfortable, bathroom shower was excellent, kitchen was loaded with supplies, and it had a very comfortable living room space to relax with a nice size table to eat at (seats 6). Screens were on all windows, so you could let the cool breeze run through without the worry of bugs (also had air conditioning in every room!). We were only two, but this home could comfortably fit 4 adults or a family (with extra 2 on a couch). Another highlight was its beautiful garden and patio to sit out on that was shaded and a cool resting spot &ndash; we spent time on the patio! We cannot say enough about this home and its location. It provided a quiet place to be, and only 8 minute car ride to Sibenik (probably the most beautiful city in Croatia), and a 30 minute drive to Krka National Park. Our only regret is that we didn&rsquo;t stay long enough. We will definitely be back to stay in Ivan&rsquo;s place and highly recommend it to all visitors! Beautiful property and warm friendly owners!! The location was excellent, being close enough (40 min.) to Split airport, Split center, Trogir and several beautiful towns to the north. The facilities could not be cleaner, with good beds , air conditioning for every room, kitchen well stocked and a terrific pool and grill area. The view of the sea from virtually every point is unforgettable. We were warmly greeted by Gordon and his father, who couldn&rsquo;t be more helpful! Any problems are quickly solved since they live next door. They will even prepare a delicious meal (highly recommend) for you at a very reasonable price. Swimming is excellent ,either at their private area or the nice public beach a short walk away. Food shopping is convenient with a small well stocked market in town and several others between nearby towns. Restaurants are plentiful and the seafood is generally excellent anywhere you go. I highly recommend this property and the beautiful country of Croatia. Vince D. , Philadelphia USA.